In a newly published paper, a team of researchers from the Salk Institute for Biological Studies and their collaborators at UC San Diego found that there is a consistent signature difference between embryonic and induced pluripotent stem cells; findings that could help implement the use of induced stem cells in regenerative medicine. La Jolla, California — Salk scientists have identified a unique molecular signature in induced pluripotent stem cells (iPSCs), “reprogrammed” cells that show great promise in regenerative medicine thanks to their ability to generate a range of body tissues. In this week’s Proceedings of the National Academy of Sciences, the Salk scientists and their collaborators at University of California, San Diego, report that there is a consistent, signature difference between embryonic and induced pluripotent stem cells. The findings could help overcome hurdles to using the induced stem cells in regenerative medicine. Embryonic stem cells (ESCs) are known for their “pluripotency,” the ability to differentiate into nearly any cell in the body. Because of this ability, it has long been thought that ESCs would be ideal to customize for therapeutic uses. However, when ESCs mature into specific cell types, and are then transplanted into a patient, they may elicit immune responses, potentially causing the patient to reject the cells. In 2006, scientists discovered how to revert mature cells, which had already differentiated into particular cell types, such as skin cells or hair cells, back into a pluripotent state. These “induced pluripotent stem cells” (iPSCs), which could be developed from the patient’s own cells, would theoretically carry no risk of immune rejection. 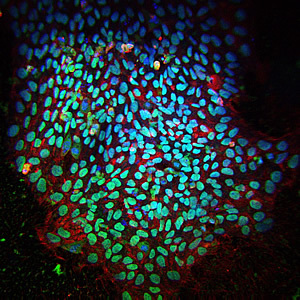 However, scientists found that iPSCs had molecular differences from embryonic stem cells. Specifically, there were epigenetic changes, chemical modifications in DNA that might alter genetic activity. At certain points in the iPSC’s genome, scientists could see the presence of different patterns of methyl groups when compared to the genomes of ESCs. It seemed these changes occurred randomly. Izpisua Belmonte and his colleagues wanted to understand more about these differences. Were they truly random, or was there a discernable pattern? Unlike previous studies, which had primarily analyzed iPSCs derived from only one mature type of cells (mainly connective tissue cells called fibroblasts), the Salk and UCSD researchers examined iPSCs derived from six different mature cell types to see if there were any commonalities. They discovered that while there were hundreds of unpredictable changes, there were some that remained consistent across the cell types: the same nine genes were associated with these common changes in all iPSCs. The therapeutic significance of these nine genes awaits further research. The importance of the current study is that it gives stem cells researchers a new and more precise understanding of iPSCs. Other researches on the study were: Dinh Diep (co-first author), Athurva Gore, Athanasia D. Panopoulos, Nuria Montserrat, Nongluk Plongthongkum, Sachin Kumar, Ho-Lim Fung, Alessandra Giorgetti, Josipa Bilic, Erika M. Batchelder, Holm Zaehres, Natalia G. Kan, Hans R. Schöler, Mark Mercola and Kun Zhang. The work was supported by grants from the Instituto de Salud Carlos III, the Focht-Powell Fellowship, Fundacion Cellex, MINECO, Sanofi, the G. Harold and Leila Y. Mathers Charitable Foundation, The Leona M. and Harry B. Helmsley Charitable Trust, CIRM and NIH. Be the first to comment on "Overcoming Barriers to Stem Cell-Based Regenerative Medicine"